If you hike through the land outside of Penpont, Scotland, you might well come to believe in fairies and elves. How else might you explain the brilliant splashes of color made with stones or plants, stone trail markers in the shape of upright pine cones, or long thin vines that literally thread together the leaves and roots of the forest? The Mystery of Picasso, a portrait of the artist at work. Rivers and Tides is a documentary by Thomas Riedelsheimer, who directed, photographed, and edited. 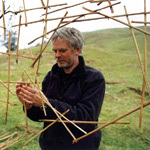 It is a portrait of the life and work of Scottish artist Andy Goldsworthy. Goldsworthy’s art is magical. Working outdoors, and with only what he finds at hand, Goldsworthy creates ephemeral masterpieces. He makes swooping oxbows from icicles or vines or leaves or snow. He makes fat piles, path markers, out of stone or ice. He concentrates nature’s color. He’ll pick dandelions all day and pack a tidepool with them, leaving a saturated yellow pot of paint for the water to wash away. He’ll pick up red and white rocks from the streambed and then set them back down, all lined up, forming a dense path of color through the otherwise rusty jumble of stones. He’ll cut thickety, thistly plants and use the black roots and the yellow stems to make a carefully patterned, temporary rug under a tree. His art is ephemeral. He builds one of his trademark pine cones (or “seeds,” as he likes to think of them) out of blocks of ice on a thawing river. He builds one on a beach below the high tide mark and watches the sea swallow it up. He builds a driftwood igloo over a swirling eddy at the mouth of a river and waits for the tide to carry it out to sea. He’s right, too. Driftwood carried out by the sea stays somewhat intact as it floats away, still art, but changed by nature. He makes long chains of leaves (pinned together by thorns) and lets the currents in a creek pull them downstream like a Chinese paper dragon, adding motion to his sculpture. “It doesn’t feel at all like destruction,” he says. There is no doubt that Riedelsheimer picked a wonderful subject for his documentary. On top of that, he’s made a good movie, although it is a mixed bag. The cinematography is outstanding. Riedelsheimer shoots on film, not video. The rich, lush look proves that it was the right decision. In addition, he uses a crane in a half dozen key shots throughout the movie, and the effect is breathtaking. As the crane moves the art piece gains a new dimension and it seems to come alive. Fred Frith provides the music for the movie, which is often good, but sometimes distracting. The trouble is that the music sets a mood. If your own reaction to Goldsworthy’s art is the same as Frith’s, his music adds to the piece. But if the music is serious and ponderous, for example, it’s harder for you to have any different type of reaction, say excitement or amazement or humor. The most unfortunate failure of the filmmaking is in Riedelsheimer’s lack of narrative structure. It makes the movie feel overlong. Usually, “overlong” is fixed by cutting, but if anything, I wanted to see more of Goldsworthy’s work. In this case, “overlong” would have been fixed by a better sort of structure. As it is, you never know where the movie is going. It is a series of episodes, each centering on a work or a commission. But you never know which work will be the last one in the movie. The film itself keeps looking the same. Just having a playbill or a table of contents would have made the film more interesting, knowing that the movie wasn’t, in fact, interminable. In spite of the fascinating subject matter, I started to get bored and I sensed it in my audience too, at about the time Goldworthy starts talking about working with sheep. “Working with sheep” is just odd enough and the boredom just ripe enough, that I might have even heard some inappropriate laughter. Ironically, a second viewing of the film is almost guaranteed to be less boring because you’ll know what to expect, and when. But if the film’s structure is particularly disappointing, it may be only because the subject matter is so interesting and the photography so beautiful that the film has set itself a higher standard. In any case, unless you live in Scotland and can see Goldsworthy’s work in person, you should go see Rivers and Tides.